Have you have ever heard of oil pulling? I had never heard about it either, but I was intrigued when I started reading about it. Oil pulling~(a simple method of oral detoxification) is an Ayurvedic healing practice that dates back 5,000 years and it has many wellness benefits that extend far beyond the mouth itself. It’s an easy way to rid the body of toxins by swishing an oil in your mouth twice a day — and it’s 100% natural and completely safe! GuruNanda Pulling Oil features a proprietary blend of 4 different oils, which together perform at a higher level than the single oils routinely used for oil pulling. When Dosha balanced pure oil is swished in the mouth, oil soluble toxins dumped in saliva adhere to the oil. According to Kulreet Chaudhary, MD a prominent neurologist and Ayurveda expert “the body has several mechanisms that allow it to ‘dump’ toxic particles into the salivary glands. Following Ayurvedic tradition, oil pulling helps to increase the secretion of saliva and trap the toxins within the oil particles. With oil pulling, the salivary glands of the mouth function as a detoxifying organ”. The act of swishing the oil pulls the oil soluble toxins and harmful microbes residing in the mouth from the fat cells. When practiced regularly, oil pulling can reduce inflammation. That is because as the level of toxins in the toxic fat decreases, the body withdraws water around them and reduce inflammation. Consequently, the PURE system that has become ineffective can finally function effectively again . The acts of exercising, eating right, drinking water and breathing facilitate weight loss and promote better health. 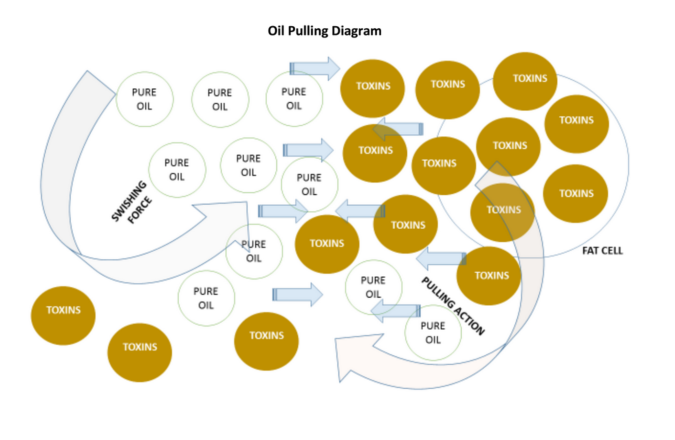 As per customer reviews on www.earthclinic.com, oil pulling can help improve oral and systemic health, which can help alleviate tooth decay, bad breath, headaches, migraines, diabetes, asthma and acne, as well as whiten teeth. Its been established that healthy teeth lead to a healthy heart and overall good health. I have been using this oil for a little under a week now. It feels weird at first, because it is oil in your mouth. After a while I got used to it and it doesn't bother me. I swish once or twice per day, whenever I remember. I am anxious to see results such as weight loss. I feel great knowing that I am helping to rid my body of toxins! Pull up your socks for the information which i am giving you something great for the you to burn fat. I have read information about gurunanda pulling oil reviews from this website. So many tips they have given to understood the http://www.topbritishessays.com/uk-oxbridge-essays-com-review website info. That's why? we are following the instructions and articles from this website.